Mr. Justice V.R. 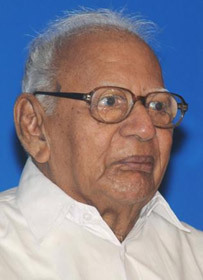 Krishna Iyer, the living legend was born on November, 1915. He was elected as the M.L.A for Madras Constituency in 1952. He became Minister for Law, Home, Irrigation & Power, Kerala State, 1957-59 during which he drafted the landmark Kerala Land Reforms Act. He was later appointed as a Judge in Kerala High Court during 1968-71. He was the Member of Law Commission from 1971 to 1973. The other offices he adored were Vice President of Indian Society of International Law; Indian Assn. of Lawyers; Founder-Director of Kerala Law Academy; President of International Centre for Kathakali, Delhi; Member of Law Faculty of the Kerala, Cochin & Aligarh Muslim University. ; Executive Comittee of Central Animal Welfare Board; Bharatiya Vidya Bhavan (Delhi Branch); Kerala History Association., etc. ; He was associated with Indi-soviet Cultural Socy., Indo-G.D.R. Friendship Society, International Democratic Lawyers' Association & Several cultural Organizations. He was appointed as Judge of the Supreme Court of India on 17.7.1973 and retired on 14.11.1980. At the age of 95, he is still active in public life with daily meetings and discussions. Dr K N Chandrasekharan Pillai is renowned legal luminary adoring the leadership of many institutes of law and has considerable publications at hand. He received his B.Sc. from the University of Kerala and received his LL.B. and LL.M. (first rank) from the University of Delhi. He received his second LL.M and S.J.D. from the University of Michigan Law School in the United States. Dr KNC Pillai practiced law before the Supreme Court of India before joining the Campus Law Centre at the University of Delhi. He joined Cochin University and became director and later dean of the School of Legal Studies there. He served as the director-designate of the National University of Advanced Legal Studies. In addition to being the director of the Indian Law Institute, he was a part-time member of the Law Commission of India, and is the member of the syndicate of Cochin University of Science and Technology representing the University Grants Commission, editor of the Journal Section of Supreme Court Cases, Lucknow. He was also the editor of the Journal of the Indian Law Institute, New Delhi and is a member of the editorial boards of the Cochin University Law Review, Academy Law Review, Kerala Bar Council News and Bangalore Law Journal. Prof Bhasker Iyer has been teaching English language including sessions on Accent Neutralization, Voice Modulation, Public Speaking etc over the years. He tool voluntary retirement from State Bank of Travancore, Kochi, Kerala after his 22 years stint as Manager. He has completed his MA and MPhil and is currently the All India Director of the English Department in Triumphant Institute Management Education Ltd (TIME). He also teaches in Amritha Institute of Medical Science, IIPM and is faculty in CUSAT Law department. As a widely acclaimed Language expert he has offered his services to many institutions and has completed teaching 10,000 hours. Prof NR Menon is a known figure with a wide network in social life. He completed his MCom and has also completed Certificate in Counseling from St Thomas University, Rome. He does Research in Value Education with Zoroastrian College in Mumbai and has been instrumental in starting Master Coaching Board in Kochi, Kerala and have produced an impressive array of brilliant students. He was awarded the Communal Harmony Award in the year 2002 by Kerala Higher Education Trust for his pioneering efforts in arena of religious harmony and secularism and a staunch Sai Baba devotee. He is the Core faculty of Cultural Education in Amritha Vishwa Vidyapeedom University in Kochi and Kollam. He has been assisting in conflict resolution through counseling and imparting of value education. Prof KC Abraham Sir is a retired lecturer in Political Science with a wide experience of 32 years in Sacred Hearts College, Thevera, Ernakulam, Kerala. He did his degree from St Josephs College and Post Graduation from Bangalore University in Political Science. He was frontrunner in organizing Speaker’s Forum in Sacred Heart’s College, Thevara and also various literary activities. He is also the Advisory Member of Centre for Public Policy Research. Uddipana Goswami is the author of the poetry collection “We Called the River Red: Poetry from a Violent Homeland” (New Delhi: Authors Press, 2010). She is also a media consultant and PhD scholar at the Jawaharlal Nehru University, Delhi. Her focus areas are ethnicity, nationalism, migration, indigenous-settler conflicts, internal displacement, conflict transformation and ethnic reconciliation in Northeast India. She has done several studies on these issues notably for the East West Centre, Washington and the Indian Council of Historical Research, India. Uddipana has earlier worked with a number of major media houses, like India Today and National Geographic Channel (India), before turning to sociological research. Her academic and creative writings and occasional translations have been published in print as well as online from Australia, New Zealand, the UK, the USA, South Africa, Bangladesh and India. 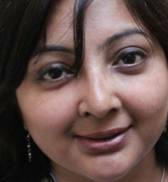 She is Assamese literature editor of Muse India, a literary e-journal. She blogs at www.jajabori-mon.blogspot.com. Adv SK Balachandran is a practicing lawyer in High Court of Kerala, lower courts and other tribunals like DRT, CAT etc. He had 26 years of standing and has been the Additional Central Government Standing Counsel in CAT, Ernakulam for 6 years. Further he was the Standing Counsel for BSNL and is the Senior Panel Advocate of Corporation Bank and of Kerala High Court Legal Service Authority. He is a trained and accredited Mediator by the Mediation and Conciliation Project Committee of Supreme Court of India and is a member of the Kerala Mediation Centre and has mediated in many issues. His areas of specialization are Civil Laws, Service and Constitutional matters. Adv Chandralekha is a practicing advocate in High Court of Kerala with a vast experience of 30 years. She is accredited by the Mediation and Conciliation Project Committee of Supreme Court of India. She is a regular face in High Court Mediation Centre and has been sitting in Adalats to settle various disputes. She is conversant in mediating disputes relating to family, property etc and is an accredited Mediator of the High Court and Kerala Legal Service Authority and is also a member of the Consumer Forum in Kerala. Adv Lalitha Nair is a practcing Advocate in the High Court of Kerala for 26 years. She has been the State Government Pleader for two terms and is currently the Central Government Pleader and also authorized Notary. She is a life member of People’s Council for Social Justice and has mediated numerous cases coming before her. She is also the reporter of Income Tax Reporter, Sales Tax Reporter, Indian Law Review (Kerala) and Company Law Institute Cases. She has contributed many articles in leading journals including Kerala Law Journal on various issues of interest. She is a member of Kerala High Court Legal Aid Service and was the Secretary of Indian Federation of Women Lawyers. Adv Mathew Kuriakose is a trained mediator and accredited by the Mediation and Conciliation Project Committee of Supreme Court of India and has been practicing in the Kerala High Court for almost 17 years. He is a graduate in Science from Sacred Hearts , Thevara and took his Law degree from Calicut University. He has hands on experience on litigations relating to Arbitration, Constitution, Company, Insurance, Banking, Government Relations, Co-operative Societies, Trademark, Copyright, Marriage, Divorce, Child Custody, Electricity and Telegraphs. He is competent in drafting and conveyance. Adv Sreelal Warrier is a known face in the field of mediation. He is an International accredited Mediator by ADR Chambers UK and also accredited by the Mediation and Conciliation Project Committee of Supreme Court of India. In addition to this he is a Member of the Kerala High Court Legal Services Committee and Adalaths under the Legal Service Authority, Empanelled Mediator in the Kerala Mediation Centre, Accredited Mediator of Indian Institute for Arbitration and Mediation and also the Charter Member of the Mediators’ Council of India. He is currently practicing in the High Court of Kerala for more than 20 years. He is also the Founder Partner of Warriar & Co., Advocates, Mediators, Negotiators and consultants. Paul Randolph is an Accredited Mediator (CEDR June 1999 and SPC: May 2000), and a Barrister, called in 1971. He practises from the Chambers of Ami Feder, at Lamb Building, Temple, London. He is Course Leader and Lecturer on a Mediation Course at the School of Psychotherapy and Counselling Psychology (SPCP), Regent’s College, London, which trains and accredits mediators. He is a member of the UK Bar Council ADR Committee, a Board member of the Civil Mediation Council (CMC), and is on the London County Court Mediation Committee. He was an External Examiner on Mediation at Cardiff University Law School and has for two years co-chaired the National Mediation Helpline Provider’s Forum. He is Chair of LADR (LambBuilding ADR), a group of barrister mediators. He specialises in Commercial and Contractual claims, Employment and Workplace disputes, Commercial and Family Property conflicts, as well as Personal Injury and Professional Negligence claims. Paul Randolph is a highly experienced mediator, trainer, lecturer and author. He has mediated in a wide variety of disputes involving Commercial and Contractual claims, Employment and Workplace disputes, Commercial and Family Property conflicts, as well as Professional Negligence, Probate and Inheritance disputes, and family financial conflicts. A special area of expertise is in the psychology of conflict and conflict management. He has given presentations on Conflict, and on Mediation in general, at conferences in the UK, China, India, Russia, Denmark, Italy, Hungary, Austria, Estonia, Latvia, Estonia, Turkey and Romania, to legal and business institutions, as well as to Government organisations. In 1998 he, together with Dr Freddie Strasser, an eminent psychotherapist, conceived and designed a Mediation Course: “Mediation Skills for Alternative Dispute Resolution”, at the School of Psychotherapy and Counselling, Regent’s College, London. He created and wrote all the training materials, and since 1999 has been the Course Leader on the course, having now trained and accredited nearly 1000 mediators in the UK, in the Channel Islands, and Latvia. The course is also adapted for in-house training of mediators in large organisations. The unique ‘psychotherapeutic’ model of mediation taught on his courses has achieved wide acclaim, and his book Mediation - A Psychological Insight into Conflict Resolution, co-written with Dr Freddie Strasser, was published in November 2004. It has a Foreword by the late Lord Slynn of Hadley, and was favourably reviewed in The Times by Sir Henry Brooke, former Vice President of the Court of Appeal, and current chairman of the CMC. Rajiv Chelani provides a professional service to his clients. He makes good use of his global commercial expertise gained over 23 years in various roles in 3 continents in corporate and community sector. He has worked in project management, commercial and community leadership roles. Having actively got engaged in community projects since 2004 and via his responsibilities being a local councillor, he trained to become an accredited mediator (SPC, London) and attained further Mediation qualifications from West Midlands Mediation and Transformation Services leading to Level 3 of OCN, UK. Rajiv’s name has been included In the 22nd edition (2010) of ‘Asian’s Who’s Who’ directory of British Asians. Rajiv has taken on responsibilities such as Board member of Citizens Advice in Maidenhead, Committee member of community Partnership in RBWM, steering committee of victim support scheme in Berkshire and member of Affiliations committee in ‘Mediators Beyond Borders’ USA. •	His work with Thames Valley & Greater London based mediation services. •	His training as an accredited Mediator with SPC, Regents College, London. •	As a Sr. Manager in Global 500 companies as front-end negotiator. •	Panel member of Community Partnership group in the Royal Borough. Rajiv, besides being a Mediator is an active member of various voluntary organizations in the Royal borough and other renowned UK based bodies. He is an elected member of Royal borough of Windsor and Maidenhead and represents on the board of CAB, Maidenhead, Youth Counselling service, panellist of Community Partnerships & Berkshire’s Victim support scheme. He is also a community panel member in the Youth Offending Service, Maidenhead. Having worked with people of varied ethnicities (in three continents), there is a strong cross-cultural focus which Rajiv can bring about. This has also helped him to be sensitive and resolve disputes based on different belief & value systems. 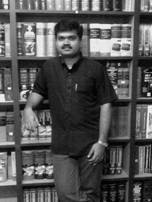 Adv Prasanth VG has been practicing as Senior Associate in Paras Kuhad & Associates, New Delhi. Graduated from the first batch of WB National University of Juridical Sciences, Kolkata in 2005. He was active in moot courts, debates, creative writing competitions etc. and has won several hundreds of prizes in the same. He has been a member of several literary and cultural associations from the school days and has worked as office bearers in many of them. He specializes in commercial litigations and arbitrations mainly involving corporate disputes and property disputes. After receiving his master’s degree in Law at the Indian Law Institute New Delhi, in May 2009, Mr. Harisankar joined the Hidayatullah National Law University, Raipur (C.G. ), as a member of faculty in August 2009. Presently he is engaged in teaching courses on Corporate Securities, Alternative Dispute Resolution and Maritime Law for both undergraduate and postgraduate students at HNLU and also serves as the Faculty Advisor to the Graduating Batch Recruitment Committee of the University. Mr. Harisankar did his undergraduate studies in Science at the Sacred Heart College, Thevara (1999-2002) and obtained his Bachelor Degree in Law from the Govt. Law College, Ernakulam in 2007.He is a recipient of the scholarship awarded by The Hague Academy of International Law and a participant of the summer academy in 2008 at the International Court of Justice, The Hague.He had also represented South Asia in an international seminar conducted by Friedrich Neumann Stiftung (FNSt) at the International Academy for Leadership (IAF), Theodore Heusse Akademie, Germany.Mr. Harisankar has been associated with the Centre for Public Policy Research (CPPR) in various capacities, since February 2006.